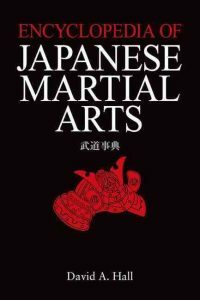 Sensei Robert Noha provides an excellent review of the book, Encyclopedia of Japanese Martial Arts. This book is a treasure trove of information for the student of Japanese martial arts and the scholar alike. It lives up to its name as an encyclopedia of the martial arts of Japan. Lineages and histories of numerous schools including both traditional and modern arts. Definitions of terms-some very well-known like ki or kata and some obscure such as tohosen (warfare on foot). Biographical sketches of both historical and modern people, ranging from Morihei Ueshiba, founder of Aikido to Otusubo Yoshihide Dozen, founder of a school of combative horsemanship in the 15th century. The entries are arranged alphabetically. For the reader who can read Asian languages there are references to Japanese, Chinese and Sanskrit words. In many cases these are highly specialized terms and would not be found in modern language dictionaries. In comparing the information to other books in the field, the entries are not as detailed but cover a much broader spectrum of information. One example is the entry on Aikido. It is a short two paragraphs. But if all the relevant entries on Aikido were put together there are many pages of information on topics such as predecessor arts, instructors, philosophy and techniques. Another book that focuses on Japanese martial arts is Budo: the Martial Ways of Japan, published by the Nippon Budokan in 2009. The entry on Aikido is 16 pages in length with numerous photographs. The book also comes with a companion DVD that illustrates many of the arts described. While there are also sections on martial arts history and terminology they are not nearly as numerous as in the Encyclopedia of Japanese Martial Arts. The Budokan book is more like a collection of articles than an encyclopedia. The book Martial Arts of the World: An Encyclopedia of History and Innovation, is a two volume work edited by Thomas A. Green and Joseph R. Svinth, published by AB –Clio in a revised edition in 2010. The entry on Aikido is 7 pages long and was probably written by Peter Goldsbury a professor at Hiroshima University and a 6th dan in Aikido. Overall this book is more like the Budokan book in that it is a series of articles written by various authors. It also covers martial arts from all over the world. Neither of these books is an encyclopedia in the sense of having several hundred entries on both familiar and unfamiliar topics. They are both more expensive at $79.00 and $168.00 respectively. A book in a more popular format is The Way of the Warrior: Martial Arts and Fighting Styles From Around the World, by Chris Crudelli, published by DK Publishing in 2008. This is a coffee table sized book with numerous photos. The Aikido entry is 2 pages long, as are most of the profiles of arts from all over the world. This book is priced at $27.00. In comparison with these three books this volume is a true encyclopedia in that it contains shorter and more specific entries without numerous (but has some) photos and drawings. For both the scholar and interested student it fills an important gap in the available information on Japanese Martial Arts due to its level of detail and Asian language references. Saki-a term in Japanese police tactics-no information online. While much of the information could be accessed online there is likely a great deal of information not available on any English language sites. There is also the difficulty in judging the accuracy of information on line. The author Dr. David A. Hall comes with impressive credentials in both martial arts and Asian culture. He has studied Japanese martial arts for over 45 years in both the U.S. and Japan. He is an ordained Tendai Buddhist Priest. He holds a Ph.D. in Buddhist Studies/Military History from the University of California at Berkeley. He has done research in Japanese, Classical Chinese, Sanskrit, Pali and French. He also received a Fulbright fellowship to study in Japan. He is currently a professor at Montgomery College in Maryland. He was also an associate of the well-known authority and author Donn Draeger to whom the book is dedicated. The book will appeal to a broad spectrum of Japanese martial arts enthusiasts from the dedicated student looking for detailed information on a specific term, art or person to the scholar or researcher looking for authentic information for use in an article, novel or film. It is a book those who love Japanese martial arts and are seeking authentic information will appreciate.